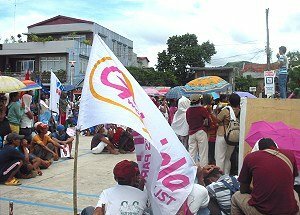 The mobilization, the biggest in the province since the assumption of the new Aquino administration, was simultaneously coordinated with another mass action in Tacloban City, as part of a regional campaign of peasant organizations spearheaded by the Samahan han Gudti nga Parag-uma ha Sinirangan Bisayas (SAGUPA-SB) to highlight the present struggle of the sector against poverty, hunger and human rights violations. According to SAGUPA-SB, the widespread landlessness of the peasants, the absence of any relevant government subsidy program for agriculture, and the anti-peasant policies such as the failed CARP (and its proposed extended version called CARPER), land conversion schemes and the pro-imperialist Mining Act of 1995, are among the major reasons for the rampant poverty and hunger of peasant families in Region 8. The militarization in the countryside meanwhile, according to KAPAWA, continues to bring about human rights abuse and damage to livelihood which further aggravate the alarmingly high level of poverty and hunger being experienced in Samar especially by the poor peasants. Recent surveys conducted by the government has ranked the province sixth among the poorest, and fourth among the provinces with the highest incidence of malnutrition of children. “’Food, not bullets!’ is the loud cry of the peasants of Samar,” KAPAWA said in a statement. A massive military campaign which covers significant portions of all the three provinces of the island of Samar is currently escalating. Aside from incidents of harassment and physical abuse of civilians by soldiers of the AFP, there have also been a number of recent reports of theft and desruction of crops by elements of the 8th Infantry Division in the interior barangays of Jiabong, Motiong, and San Jose de Buan. In Matuguinao, military helicopters have been reported to have been indiscriminately landing and trampling on rice fields. “President Noynoy Aquino has given us much talk about reforms and his so-called righteous path; but with mounting state terrorism, the exact opposite is definitely what’s happening in Samar,” KAPAWA added. The delegates from the town of Jiabong, meanwhile, said that they have an added reason to be worried about the recent series of military operations as this might be used to force the communities to accept the entry of the foreign-owned Manganese Mineral Belt Mining Corporation despite an existing provincial ordinance which prohibits large-scale foreign mining in the whole province for 50 years. According to Jiabongnon-Nagkakaurusa nga Parag-uma Hingyap Kauswagan (JINGYAP), the people of the town are against the setting up of a 2,000 hectare manganese mining concession in Barangay Bawang because it threatens Jiabong’s tahong industry, the vast farmlands in the town’s plains, and the forest watershed not only of Jiabong but also of neighboring Catbalogan. The mobilization is considered to be a kick-off activity for a series of peasant and multi-sectoral mass actions in Samar which aims to drumbeat, among others, the call for the passing into law of the Genuine Agrarian Reform Bill (GARB); the institutionalization of a comprehensive agrarian subsidy program; the wage increase for farm workers; and an aid system for victims of calamities and infestation. The current peasant campaign, according to KAPAWA, shall treat as urgent the demand to put a stop to the escalating militarization and human rights violations in the island, and to large-scale foreign mining in the province and the whole region. Mr. Santiago Salas, the dismissed priest turned spokesman of the political arm of the Communist Party of the Philippines (CPP) in Eastern Visayas kept on barking the development assistance of the 8ID to be “militarization” which is a usual tactics of the CPP-NPA-NDF to create wedges between the collaboration of stakeholders and the soldiers in the area. “Militarization” is described when there is a pursuit of military aims with a strong influence of military government and the government policy is invested in the military”. This is not what is happening here in Eastern Visayas. What the 8ID is doing in partnership with the local leaders of the three provinces is the conduct of routine security operations in order to preempt the enemy’s illegal activities such as liquidation, extortion and brutal violation of human rights that sow terror in the local communities which definitely hinders the desired development particularly in the countryside. The decision of the MCC to partner with other relevant stakeholders such as the local government to ultimately realize its cause to bring-forth development in Samar is an intelligent choice because development could never be attained with the absence of harmony. More so, peace and security is an essential pre-requisite to attain development. The MCC compact project provides funds amounting to $214.4 million to construct and repair 220 kilometers of Samar Road. This road, which passes through 15 municipalities, will improve access to markets and services for farmers, fishers, and small businesses in some of the poorest provinces in the island that will greatly improve the lives of our people. Who among our people is not favor for these projects? Who among our people still wants to remain stagnant to their barrios without any dreams to be progressive someday? And who among our people does not want to be progressive and competitive not only in their neighboring barrios or towns but to the other nation as well? The answer is obvious, only the CPP-NPA-NDF desires that the people and our country to remain impoverished and poor. Why? Because when people progresses, all propaganda lines and issues that they frequently recycle to brainwash these people will be proven to be lies. Summary executions, tortures, harassment, indiscriminate firing, robbery, destruction of property and other human rights violations are all activities of the CPP-NPA-NDF that they finger pointed to be allegedly being practiced by the soldiers. Who will forget the so called “Catarman incident” where eight (8) policemen were mercilessly killed last August 21, 2010? The “Matuguinao massacre” that robbed two (2) lives and left one (1) in a critical condition last March 21, 2010? In this incident, Mylene dela Cruz who endured gun shots at her right leg and still under medication through the assistance of the 8ID. Also, the killing of an innocent farmer known as Arman Diaz of Brgy Madoroto of same municipality who was mercilessly slain by the terrorist in front of his children and wife and afterwards dragged and exhibited at the center of barangay plaza last February? The torture of Luis Durico, brgy Chairman of Genaronagan, Lope de Vega in Northern Samar and was also brutally slaughtered by the terrorist with his body also dragged at the center of brgy and beheaded in front of family and constituents in March 2010? The nation-wide anti-DPA campaign named “Oplan Ahos-Zombie”, “Operation Missing Link”, “Kadena de Amor, “Takip Silim, “Purga” and “Paglilinis-hanay”; Digos Massacre, use of landmines and countless burning of buses, destruction of cell sites, extortion, permit-to-campaign fees, etc. are all perpetrated by these organization. These inhumane, barbaric and animalistic acts of NPA in terrorizing the civilians are already well known tricks of soliciting support, following the Sun Tzu’s dictum, “Kill one to terrorize one thousand”. History speaks that countless violation of human rights were recorded but as if the NDF who shouts for a genuine human rights were voiceless and effortless. Meanwhile, the 8ID as well as the Army units in the area remain steadfast in their mandated mission and continuously upholding the programs that promotes peace and development. Major General Mario Chan, the 8ID’s commander assured the public that the forthcoming projects of the MCC will be properly supported and secured as well as the other NGO’s who desire to help Samar to become a developed and competitive province. “We are appealing to the public to work hand-in-hand with the authorities to include media entities, various religious and people’s organization to take account our moral obligations to maintain harmony in the province”, Major General Chan adds. “Mr. Salas must apologize to the people for persecuting the common good of the people and for mocking the long desired development of the island. He is depriving the people of things that they supposed to deserve long before time. In his concluding statement, Major General Chan explained to the people that development and security must go hand in hand. “Development could never be achieved if we will continue to allow these armed bandits to terrorize our people and hinder the economic growth and developed of our three (3) Samar provinces”. TACLOBAN CITY – As part of its continuing efforts to promote the coconut industry in Eastern Visayas, the An Waray Party List is set to hold the 3rd Oktubafest on December 23 at the Leyte Park Convention Center along Magsaysay Boulevard, Tacloban City. Mitchelle Basal, the Chairman of the Executive Committee of Oktubafest, informed that the Oktubafest is a food, drink and music festival showcasing the local tuba wine. The annual event aims to promote the Region’s cultural heritage as well as highlight the local tuba industry. The Oktubafest will kick-off with the Opening Program at 8:30 in the morning. The Tuba Techno Marketing Seminar, a seminar on different technologies and marketing skills under the auspices of the Department of Science and Technology, Department of Trade and Industry and the Philippine Coconut Authority will start at 9:00 o’clock in the morning. The target participants are tuba producers from various municipalities in the Region. The opening of the Tuba Trade Exhibit Booths of the Tuba producers and representatives of different Local Government Units, will open at 9:00 o’clock in the morning. One of the highlights of the 3rd Oktubafest is the Tuba Photo Essay Contest, an exhibit of different photo essays that feature tuba and the cultural milieu of Eastern Visayas. This is open to all interested participants. Another highlight is the On the Spot “Kawit” Art Contest, a painting contest highlighting the lakug or kawit, which is an indispensable tool for tuba gathering. This is also open to all interested participants. What is Oktubafest without the Wine Tasting Contest? This year, the guests of the festival will help in choosing the best Bahal and Bahalina through a wine tasting festival. The guests will be given the chance to sample the different varieties of tuba from the different municipalities. A cooking contest wherein the Best Tuba-Infused Dish and Kotil will be chosen will be opened to LGU contestants with ages 16 to 25 years old. A Kuracha Dance Contest will be conducted at 4:00 o’clock in the afternoon while at 7:00 o’clock in the evening, a Winaray musical variety show and a Waray Group Singing Contest will be conducted. The Winaray Group Singing Contest features a choreographed group singing highlighting the best Waray folk music. TACLOBAN CITY – The province of Leyte in Eastern Visayas region has once again proclaimed as the Most Business-Friendly Province of the Philippines. Leyte Governor Carlos Jericho L. Petilla personally received the award during the Awards Rites held at 9:00 o’clock in the morning of October 15, from no less than President Benigno S. Aquino III. The awarding Most Business-Friendly Local Government Unit Awards was one of the highlight of the three-day Philippine Business Conference held at the Manila Hotel. Last year, on October 21, also at the historic Manila Hotel, Governor Petilla received the first Most Business-Friendly Province Award of the Philippines. The province of Leyte under the leadership of Governor Carlos Jericho Petilla, has been promoting trade and investment not only in for Leyte but also for the entire Region 8. Perhaps, a very good proof for its being business-friendly is the passage of the Leyte Investment Code and the institutionalization of the Leyte Province Business Month celebration every October of each year. The province of Leyte has been in constant collaboration with the business sector of the province thru the Leyte Chamber of Commerce. In fact the SME Development Center was constructed with the partnership between the Leyte Chamber members who donated the money needed for the renovation of the Old Prison to the SMED Center. The Leyte SMED Council is chaired by the LCCI. In order to assist starting entrepreneurs in the field of Information Technology, Governor Petilla in partnership with the Department of Science and Technology, launched the Technology Business Incubator at the ICOT Park which is a PEZA Zone. The starting entrepreneurs are provided six months free office space and equipment facilities, business development and technical services. The Most Business-Friendly LGU Award seeks to recognize municipalities, cities and provinces for their efforts in instituting good governance in promoting trade and investment such as innovative and sound business licensing procedures, and efficient conduct of daily operations. The award highlights the best practices of local government units that promote the growth of businesses, including investment promotion and streamlining of procedures for issuance of business permits in the most expedient, efficient and friendly manner. This is seen to significantly help lower the cost of doing business in the country. The Search for the Most Business Friendly LGU Awards which has three categories namely, Province Level 1: 1st - 3rd class provinces and Level 2: 4th - 6th class provinces; City Level 1: 1st-3rd class cities and level 2 for 4th-6th class cities; and the Municipality Level 1 for 1st -3rd class municipalities and Level 2 for 4th -6th class municipalities. The awards criteria for the province level are Trade, Investment & Tourism Promotion; Quality Management and Innovation; MSME Development; Public-Private Sector Partnership; and Inter-Local Government Relations. The Leyte Chamber of Commerce and Industry under the Leadership of its president Mr. Willy Julio, has nominated the Provincial Government of Leyte to the Search for Most Business-Friendly Province Award. 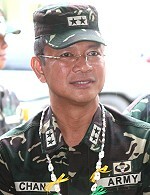 The National Democratic Front-Eastern Visayas today slammed 8th Infantry Division chief Maj. Gen. Mario Chan for launching widespread military operations under the extended Oplan Bantay Laya, and for coercing the local government in Western Samar to support the Aquino government's "counterinsurgency" campaign. "It is clear Gen. Chan is asserting military supremacy in making the inappropriate and insulting demand to the Western Samar provincial government to increase and expand the "mobility corridors" so the 8th ID troops could pursue the New People's Army," said NDF-EV spokesperson Fr. Santiago Salas. "This proves the government's so-called development projects, especially under the aegis of the Millennium Challenge Corporation, are not really beneficial to the people but in support of the "counterinsurgency" campaign. It is in fact the military that is calling the shots, and the militarist solution to social unrest lurks behind the US-funded Samar Road and other alleged development projects. While pretending to aid the people of Samar, the more than $200 million MCC development assistance is actually serving as the Trojan horse of militarization." Fr. Salas also said the ongoing militarization in Northern and Western Samar belie the Aquino government's promises of peace and development. "Human rights violations continue under the extended Oplan Bantay Laya, and are bound to mount after January 2011 when the Aquino government pursues a new scheme in the mold of the US Counterinsurgency Guide. Gen. Chan's pronouncements the military ushers in peace and development are thus nothing more than sugarcoating militarization. Since August in fact, wide areas of the countryside in northern, western and eastern Samar are now warzones where the military violates human rights and international humanitarian law with impunity. These include areas in the Western Samar towns of Jiabong, Motiong, San Jorge, Catbalogan, Gandara, Paranas, San Jose de Buan and Matuguinao, on to Las Navas and other Northern Samar towns, as well as Jipapad in Eastern Samar. The 8th ID troops encamp in civilian communities, putting these in danger, in gross violation of international humanitarian law. Troops from the 52nd IB, 63rd IB, 34th IB, Scout Rangers and other military and paramilitary units have also been accused by civilians of summary executions, torture, harassment, indiscriminate firing, robbery, destruction of property and other violations." The NDF-EV spokesperson called on the local government, Church, media, human rights advocates and other sectors to expose and oppose the militarization of Samar and to reject the US Counterinsurgency Guide and its MCC component. "The victims of human rights violations must stand up and demand justice and redress for the decade-long ordeal caused by Oplan Bantay Laya. The people must unite, expose and oppose the militarist and fascist solutions being railroaded by the Aquino government as directed by the US COIN Guide. If it wants to show its genuine concern for the people, civilian authority must confront and reject the fascist imposition of military supremacy. The path to genuine peace and development is not that made by the few and by the interests of US imperialism; it is made by the people's struggle for justice, national freedom and democracy." TACLOBAN CITY – Palo Archbishop Jose S. Palma is the new archbishop of the Archdiocese of Cebu. Archbishop Palma will replace Ricardo Cardinal Vidal whose resignation was finally accepted by Pope Benedict XVI, a report posted at the CPCP website stated. It was learned that Cardinal Vidal submitted his letter of resignation in 2006 when he turned 75 years old. Archbishop Palma’s appointment was announced at the Vatican at 6:00 in the evening, Manila time, on October 15. PIA has been trying to reach Archbishop Palma, but to no avail, as of press time. The CBCP report however said that when reached, Archbishop Palma said he is “overwhelmed by the love of God” and the trust of the Holy Father. “Unworthy as I am, I accepted the appointment out of obedience,” he said. This was the same message when he was appointed as Archbishop of Palo while serving as bishop of the Diocese of Calbayog. When reached by PIA, the clergy in the Archdiocese of Palo expressed mixed reaction at the Archbishop’s new appointment. “Considering the prestige of his new assignment, we thank God for this special grace and rejoice with the people of God in Cebu for this great gift from God,” Fr. Gilbert added. “But that’s how the Church operates. The Lord gives, the Lord takes away. Blessed be the name of the Lord. The sadness who knows, is a preparation for better things ahead for the Archdiocese of Palo,” the good Msgr. said. The Lord will give us a Shepherd after His own heart in the same manner that He gave us ABP Palma as a gift for us for four years and 7 months. I pray for his fruitful shepherding in the community entrusted to his care,” Msgr. Ramon added. “These will all be passed on to his successor and we pray that the next Archbishop may continue to carry his dreams for the Archdiocese,” Fr. Petilos concluded. “We know that he has been a good bishop, a caring father, an understanding brother, and above all, a loving shepherd to all of us. Surely, he will always be in our hearts always. We will pray for him to remain faithful in his love and service to God and to the people whom God entrusted to him,” he added. 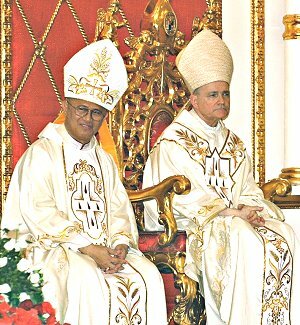 It was in March of 2006 when the 60-year old prelate was appointed as archbishop of Palo in Leyte. Archbishop Palma was born in Dingle, Iloilo on March 19, 1950. He studied his philosophy at St. Vincent Ferrer Seminary his theology at St. Joseph Regional Seminary. He then earned his Licentiate in Sacred Theology at the University of Sto. Tomas in Manila, and his doctorate at the St. Thomas Aquinas Pontifical University in Rome. He was ordained priest for the Archdiocese of Jaro on August 21, 1976. After a year as parochial vicar at the Jaro Cathedral, he was given a teaching assignment in St. Vincent Ferrer Seminary. He then became rector of the St. Joseph Regional Seminary. At the same time he occupied several positions in the diocese. In 1997 he became the parish priest of the Parish of St. Anthony of Padua in Jaro. In 1998, he was named Auxiliary Bishop of Cebu by then Pope John Paul II. A year later, he was transferred to the Diocese of Calbayog. Archbishop Palma is currently serving his first term as vice-president of the Catholic Bishops’ Conference of the Philippines. Cardinal Vidal will continue to head Cebu archdiocese as Apostolic Administrator with powers of an ordinary bishop until Archbishop Palma’s installation. MANILA – The number of Filipino nurses aspiring to practice their profession in America continued to drop year-on-year in the third quarter, the Trade Union Congress of the Philippines (TUCP) reported over the weekend. TUCP secretary-general and former Senator Ernesto Herrera said only 2,227 Filipino nurses took the US NCLEX for the first time from July to September, down 38 percent or 1,355 fewer compared to the 3,582 in the same three-month period in 2009. TUCP now expects some 5,000 fewer Filipino nurses taking the NCLEX the whole of this year, according to Herrera, former chairman of the Senate committee on labor, employment and human resources development. Thus far, a total of 7,780 Filipino nurses took the NCLEX for the first time from January to September, down 35 percent or 4,074 less versus the 11,854 in the same nine-month period last year. The NCLEX is the licensure exam administered by the US National Council of State Boards of Nursing Inc. The number of Filipino nurses taking the test for the first time is a reliable indicator as to how many of them are trying to enter the profession in the US, Herrera said. A total of 15,382 Filipino nurses took the NCLEX for the first time in the whole of 2009, down 5,364 or 26 percent from 20,746 in 2008. All told, since 2005, some 90,000 Filipino nurses have taken the NCLEX for the first time, that is, excluding repeaters. Despite the decline in the number of Filipinos nurses seeking US employment, Herrera said the Philippines remains America's largest supplier of new foreign nurses, after India, South Korea, Canada and Nigeria. Outside the US, the Philippines is also the United Kingdom's third biggest supplier of new foreign nurses, after India and Australia. Herrera said many Filipino nurses have temporarily sought employment in local industries, mainly services, while waiting for more gainful work in foreign labor markets. "We now have thousands of registered nurses engaged in services that have nothing to do with their profession, working as contact center staff, baristas, cashiers, even lotto terminal operators," Herrera said. The Philippine Nurses Association (PNA) earlier estimated at 200,000 the jobless nurses in the country. "A total of 37,679 new practitioners passed the local licensure exam in July. They are now competing for jobs with some 160,000 unemployed nurses," PNA said. TUCP supports the continued deployment of Filipino nurses to lucrative overseas labor markets. "We obviously have a large surplus of nurses," Herrera said. "We would prefer that government encourage the deployment of nurses, and discourage the placement of domestic helpers overseas," Herrera said. "Filipino nurses abroad are generally less vulnerable to employer abuse. Their skills protect them. Their skills are not easy to replace, so employers are careful not to mistreat and drive them away," he said. "As to domestic helpers, they are extremely susceptible to abuse because they live with their employers, and their skills are easy to replace," Herrera said. "In Hong Kong for instance, for every Filipino domestic helper, there could be dozens of Indonesians, Thais and even local Chinese replacements waiting in line. This is also true in the Middle East. Potential substitutes from Sri Lanka and Indonesia abound," he added.